Open the Grofers mobile app or visit the website. Give your location and select the local stores of your choice. Pick the items you wish to purchase. Add to the cart and place the order. Grofers is offering a flat 20% cashback on all orders made using Paytm wallet. Customers can purchase any item of their choice using the Grofers app at their preferred local stores. Choose to make payment using your Paytm wallet. Get the Grofers 20 off codes available here and provide it at checkout. Make the payment using Paytm wallet and the Grofers delivery boy will get your order delivered to your home in just 90 minutes. Grofers 20 off offer is available only for Paytm customers. The Grofers 20 off coupons can be used by a user on two orders. Like Grofers, Nature’s Basket also givng huge discounts on grocery orders. To grab those discounts check Nature’s Basket Grocery Coupons and save more. The offer is available for all users both new and existing users. The cashback amount will be credited to your Paytm wallet within 7 working days. Maximum cashback amount that can be obtained per transaction is limited to Rs.100. Grofers with HDFC Bank is offering a flat discount of 20% for new customers on their first order.Download the Grofers mobile application shop at their website. Login to your account using the username and password provided at the time of registration. Give your location. Select the local stores from which you wish to shop. Select the items of your choice and place the order. Give the Grofers first time coupon code GROFHDFC20 at checkout. You can find these type of first order discount offers in Big Basket also, To get those offers check Big Basket First Order Coupon and pay less. Choose to pay using online banking payment option. Make payment using HDFC Bank credit or debit card to get the 20% discount. The offer is valid only for new users. The 20% discount will be provided on payments made using HDFC credit or debit card. The offer is available for Grofers Hyderabad, Grofers Lucknow, Grofers Chennai and to all customers where Grofers is operating. Pros: Get Latest Discount Coupons and Promo Codes For Grocery Orders. 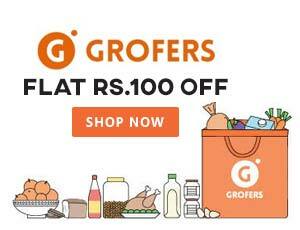 Grofers Bangalore is offering a flat discount of 10% for first-time users in Bangalore. Grofers provides all items that you need daily such as groceries, fruits, vegetables, beauty products, baby care products, kitchen essential and more. Login to your Grofers account. Select the local store of your choice. Pick the items you require and place the order. No coupon code is required to avail the offer. Make the payment and your order will be delivered to your doorsteps within three hours of processing the order. The maximum amount of discount that can be obtained per transaction is limited to Rs.100. Delivery charges of Rs.49 have to be paid if the order value per store is less than Rs.250. If still searching for more offers for grocery, then you can check Nature’s Basket Bangalore Coupon Codes and get more discount. Buying groceries have become easier with Grofers. Living in busy cities like Hyderabad makes it difficult to go out every time for buying the groceries especially in a busy schedule. However, with Grofers you can not only save your time but also your money on discounts by using the Coupon Codes and other offers from Grofers. A new user gets a discount of 15% on his first purchase by using the code GROFERS15 pan India. There are offers on categories, minimum purchases and cashback offers from Grofers. In fast moving city like Mumbai where travelling from one place to another is itself a hectic schedule, buying groceries is rather a hard nut to crack for Mumbaikars. Grofers makes it real easy for the people by delivering the needed groceries to home in time with some massive discounts on your purchases. Using Grofers Coupons for making payment helps you avail cashbacks, discounts and freebies on your purchases. There are discount coupons for both new and existing user. You get a discount on buying a particular brand or product or of some amount from Grofers. Grofers is offering a flat discount of 15% on various products for new users. Login to Grofers app. Select the store of your choice. Pick the products of your choice and add to the cart. Give the Grofer 15 off coupon code available here and place the order. Make the payment and your order will be delivered to your doorsteps in 90 minutes depending on the traffic and weather conditions. The offer is valid only for new users of the mobile app. The maximum amount of discount that can be obtained per transaction is limited to Rs.100. The offer is not valid on cash on delivery payments. The offer is available only for online payments. Grofers is offering a flat discount of 15% on everything for new users.Download the Grofers mobile app or open the Grofers web app. Register at Grofers giving the details such as name, address and other details essential for successful transactions at Grofers. Give your location to get the list of stores available to shop at. Pick the items of your choice and place the order. Give the Grofers app promo code GROFERS15 to get the discount. Like Grofers, Big Basket also having special offers for new users. To grab those deals check Big Basket New Users Offers and enjoy the shopping. The maximum amount of cashback that can be obtained per transaction is limited to Rs.100. The offer is valid only for new users. The Grofers new user coupon can be used only once per customer on their first order. Pros: Exciting Discount Deals and Offers For Grofers New Users in all Cities. Grofers mobile app makes it easy to purchase fruits and vegetables from your preferred local stores. You do not have to visit the store or wait in long queues to get fresh vegetables from stores you regularly visit. 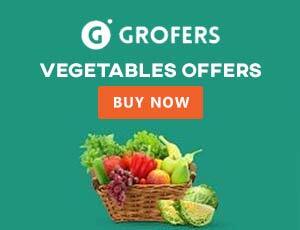 Grofers fruits and vegetable basket offer gives you a discount of 20% on your order.Open the Grofers login page on Grofers website or open the mobile app. Enter your region. Select the stores from which you wish to purchase fruits and vegetables. Build your cart and place the order. No Grofers coupon code is required to avail the discount. Place the order and make the payment. The offer is available only for Grofers Bangalore, Grofers Mumbai, and Grofers Delhi NCR customers. The offer is valid only on fruits and vegetable orders. The maximum discount that can be obtained per transaction is limited to Rs.100. Availability of multiple payment options makes it easy for the customers to shop at Grofers. Customers can make payments through net banking, credit or debit card or by paying cash on delivery. It also collaborates with third-party payment gateways such as Mobikwik, PayUMoney,and Paytm to simplify the payment process. To make it easy and safe for the customers to transact with Grofers, it offers different payment options. Grofers payments through wallets such as Mobikwik, Paytm and PayUMoney are safe and simple. 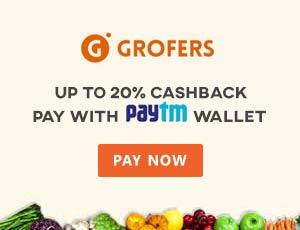 Grofers with Paytm is offering 20% cashback on orders paid through Paytm wallet. Open your Grofers account page. Enter your location. Select the stores of your choice. Pick the items you wish to purchase and then add them to the cart. Choose to pay using the Paytm wallet and place the order. The cashback amount will be credited to your Paytm wallet within 7 working days. The offer is valid only for Grofers Paytm customers. The cashback amount will be credited to the Paytm wallet only after verification of the mobile number. The maximum amount of cashback that can be obtained per transaction is limited to Rs.100. This amazing Grofers wallet offer gives you a discount of 15% when you pay using your Mobikwik wallet. If you are new to Grofers, you can download the Grofers application or visit the Grofers online store. Log into your account. Give the location and select the local store of your choice. Select the items of your choice and add to the cart. Give the Grofers Mobikwik coupon code KWIK15 at checkout to get the 15% cashback. Place the order and make payment using your Mobikwik wallet. The cashback amount of Rs.100 will be credited to your Mobikwik wallet in seven working days. The offer is valid only for Grofers Mobikwik customers. The maximum cashback that can be obtained is limited to Rs.100 per transaction. The offer is valid only for new users on first order. 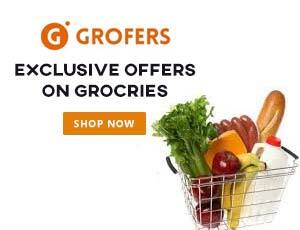 The offer is available for Grofers Mumbai, Grofers Pune, Grofers Jaipur, Grofers Gurgaon and to all Grofers users in all regions Grofers is serving. Grofers with PayUMoney is offering 15% cashback on all orders made through Grofers mobile app. Customers can order any item such as fruits, vegetables, groceries and more at Grofers. If you are new to Grofers, download the Grofers mobile app on your smartphone or visit the Grofers website. Register at Grofers by providing the required details. Give your location to know more about the offers available at your location and to ease the delivery process. Select the store from which you wish to purchase the items. Pick the items of your choice and add the items to the cart. Give the coupon code PAYU15. Make the payment using PayUMoney wallet to get 15% cashback. 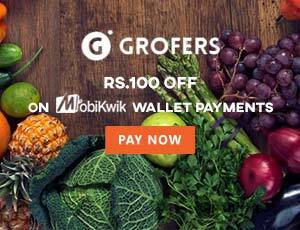 For more Grofers wallet offers check this site. The offer is available only for PayUMoney customers. The offer is valid in all regions where Grofers is serving. The maximum cashback amount that can be obtained per transaction is limited to Rs.100. The Grofers online store lets you shop for a wide variety of products in various categories. It offers nearly 1,20,000 products. You can purchase electronics, grocery, fresh produce, vegetables, fruits, cosmetics, sports goods, baby care items and other household items relaxing in a couch from your home. The Grofers refer and earn program lets you earn referral credits worth Rs.300 when you refer a friend. The app is free to download for Google Play Store and App Store.Login to your Grofers account. Refer a friend to Grofers using the Grofers referral code provided to you. You will be given Grofer referral credits worth Rs.300 when your friend makes the first order. The referral coupon will let you get a discount of Rs.100 per transaction on orders worth Rs.500 and above. The referral credits will be deposited to your account only when your friend makes the first order. The minimum transaction value has to be Rs.500 to get the referral discount. Grofers, the online delivery app operated by Grofers India Private limited was started by Saurabh Kumar and Albinder Dhindsa in December 2013. Since its debut, the e-commerce platform expanded drastically within a very short period making its presence in about 17 Indian cities. Grofers’ business model to attain maximum customer satisfaction by offering quality products and in-time delivery helped it successfully withstand the competition. Grofers offers a wide range of products about 1,20,000 products in different categories such as groceries, fruits, vegetables, beauty care, baby care, kitchen appliances and more. Grofers’ latest coupons help you save on your orders. Grofers offers free delivery on orders valued Rs.250 and above. Delivery charge of Rs.49 has to be paid on orders below Rs.250 per store. Grofers mobile app helps you track the status of your order. Grofers offers a simple cancellation and refund policy. Shopping with Grofers is easy, simple, safe and comfortable. If you need special deals, discounts, and promo codes to get additional discounts you can take a look at the deals and promo codes mentioned in this site and use them while shopping at Grofers for the best deals in town. Grofers is an e-commerce platform that enables you to order fruits, vegetables, grocery or any other household item from your local stores comfortably from your mobile phone. Grofers is owned and managed by Grofers India Private Limited. Grofers founders Saurabh Kumar and Albinder Dhindsa started this mobile app-based delivery platform in the year 2013. Grofers’ head office is located in Gurgaon. Grofers app for Windows, Grofers Android app and Grofers app for Blackberry can be downloaded from the Grofers app download link. It is currently operating in 17 cities in India and plans to expand its services drastically into other Indian cities. Grofers concentration on customer satisfaction, on-time and quick delivery and offering of a wide range of high-quality products are making it hard for the Grofers competitors to withstand the competition. By bringing the hidden offline retailers online, it is able to able provide a wide range of high-quality products in various categories. Grofers daily orders count is about 2000 orders. Grofers blog gives an update on Grofers’ latest news.